Branko hosts monthly meetups for those with an interest in the functional foods, natural health products, and bioactive sector. These events are open to industry, producers, researchers, students, investors, government and the public at large - Come join us! Are you a researcher, entrepreneur, food or personal care ingredient manufacturer, an emerging company, producer, or nutritionist? 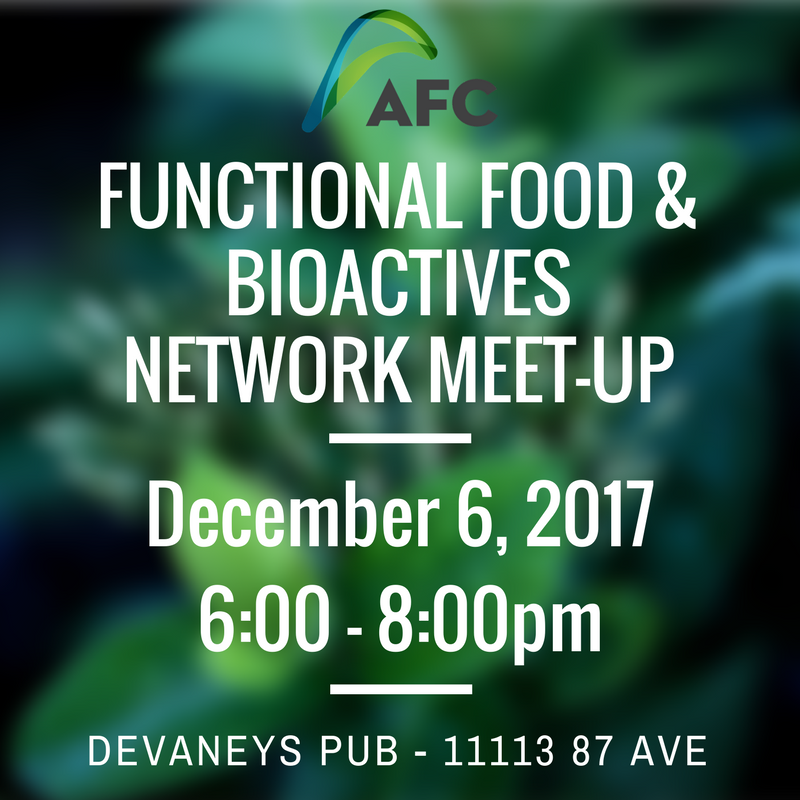 If yes, then AFC’s Functional Foods and Bioactives Network (FFBN) has something for you! This network champions the province’s functional foods and ingredient industry and assists provincial businesses in realizing global marketing opportunities. Together, we’re working to build Alberta’s value-added functional food and bioactives industries into globally competitive, profitable, and sustainable leaders. VISION - The FFB Network’s primary directive is to play a pivotal role in cultivating Alberta’s value-added products, functional food and bioactives sector by facilitating the development of novel, commercially viable technologies. MISSION - To support Alberta's research community, industry, and other partners for the development of advanced technologies and value-added products in the energing functional foods and bioactives industries. Alberta has a strong economy, an entrepreneurial spirit, excellent prototype development and scale-up facilities, world-class research centers, and an abundance of safe, quality agricultural commodities as raw ingredients. These advantages, coupled with increased interest in exploring niche, healthy food markets makes Alberta the ideal location for a prosperous and sustainable food and food-ingredient development industry. The FFB Network strongly advocates mutlidisciplinary research and collaboration. FFB Network management and research teams include experts from agriculture, manufacturing, chemistry, biochemistry, food processing, and food science. Direct access to diverse skill sets and expertise is critical as the industry develops new products and enters new markets. FFB Network focuses on developing commercially viable technologies. Forming strategic partnerships with industry to steer research activities is vital to the network's success. With respect to Intellectual Property (IP), policy is developed between partners and research providers directly on a project-by-project basis and the FFB Network itself does not hold any additional stake in IP. FFB Network builds industry and scientific relationships based on trust with ongoing commitment to open and consistent communication. This interactive approach has proven highly successful and beneficial for all partners. As a network, the FFB Network represents a large pool of expertise and resources, which offers substantial benefits to partners including access to a broad spectrum of academic expertise, a variety of funding agencies, government support groups, and increased ability to leverage financial contributions.